Skyler Koury's 3A-3C Big 6x7! The Big Kicker Bull. And the amazing 6x6. The big split G3 Bull. Time to catch up on a lot of hunting! 2012 Early and Archery Elk Review! Lots of HORN! 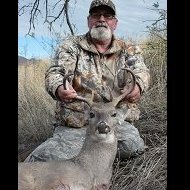 Huge Archery Coues Deer Down! Arizona Elk and Antelope Draw 2013. Make the right choice! With only 48 Hrs left in 2012 Archery Deer Hunt! 3A-3C General Mule Deer Hunt Success! Big Bucks! !